Adam's Needle, Yucca Adam's Needle is a slow-growing native evergreen shrub that will stay small, growing no more than about 3-feet-tall. In summer a tall, showy flower spike emerges from the center of the plant and displays prominently for several weeks. 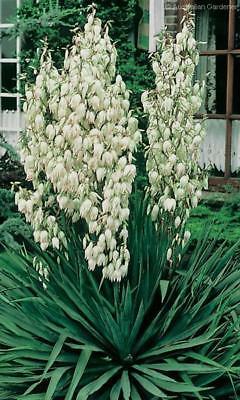 Yucca can be used as a foundation planting, specimen, ground cover or in a rock garden or border. This plant is considered mostly allergy free and causes little or no allergy problems in most people.